When Prince William & Kate Middleton announced their engagement last November, I was telling myself that their wedding will be another history in the making. The wedding date was set to be on 29 April 2011. Only 5 months to prepare for the grand event. 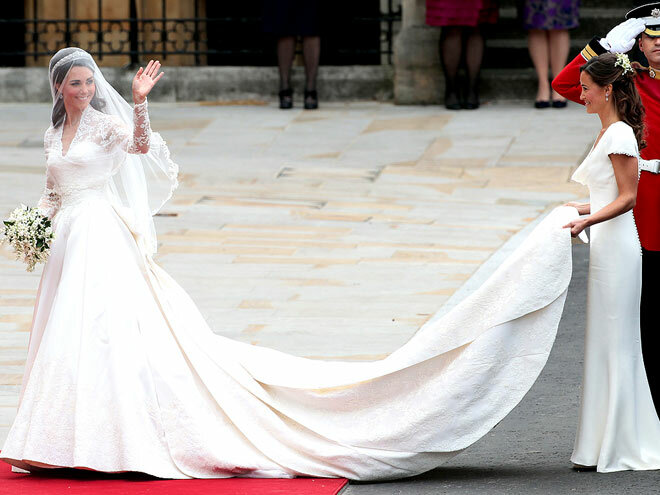 Actually, I was more excited to see how Kate's wedding dress would look like. I'm sure it's every girl's dream to look the best on their big day. I was having a mental sketch on how the dress would be. Modesty & appropriateness are important elements in designing a dress for a royal wedding, therefore strapless gowns or anything which bears too much skin is out of the question. I was imagining her to probably don a simple, off-shouldered white satin gown with fine, intricate floral embroideries. Another option would be a princess-like long sleeve gown with moderate puffy shoulders, reminiscent of Princess Diana's dress. The veil would be made of soft silk with a tiara to complete the look. The train of her gown shouldn't be too long but just the right length for that elegance & grandeur. The live telecast of the wedding concluded hours ago & I was watching the several highlights from YouTube. The most critical moment of all was when Kate stepped out from the car, revealing the dress designed by Sarah Burton of Alexander McQueen design house in which the media have been speculating for months. Below is an excerpt of an article by Kate Hogan from People magazine. The dress was composed of French Chantilly lace and English Cluny lace throughout the bodice, skirt and underskirt. The skirt, made of ivory and white satin gazar, was designed to emulate an opening flower: padded at the hips, it flowed out to the floor. The back of the dress was finished with 58 gazar and organza covered buttons fastened by Rouleau loops. The ivory silk tulle veil trimmed with hand-embroidered flowers was held in place by a Cartier "Halo" tiara, loan from the Queen. Her diamond drop earrings by Robinson Pelham was a gift from Kate's parents. I was staring at the dress in awe. The dress is simple yet so lovely - felt like straight off a fairy tale wedding. Despite Kate looking rather thin due to pre-wedding jitters, the dress was flattering. Who said ivory was too yellow for the royal bride? The colour is gonna be the top choice for modern brides who are looking for something new & fresh aside from the traditional white gown. Seen here is the young couple exiting Westminster Abbey after the solemnisation, followed by the bridesmaids & pageboys. 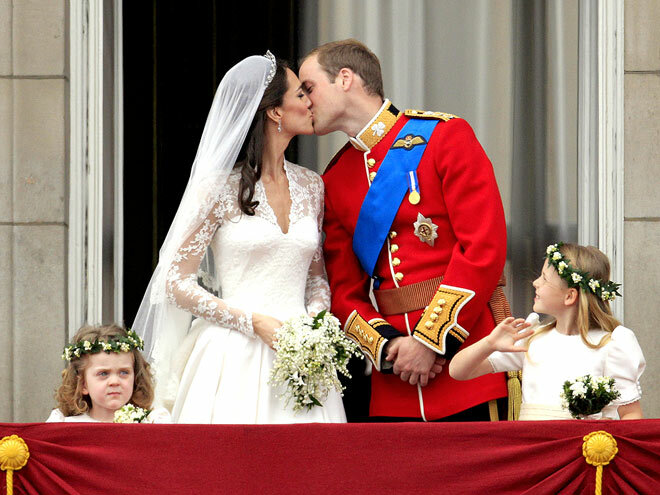 The most romantic scene just like in the movies is probably this photo of William & Kate sharing their public kiss at the balcony at Buckingham Palace. To sum it up, the wedding was grand but not overly extravagant...and I still love it. It really does look like a fairy tale wedding coming alive from those storybooks that we have grown up with. Prince William & Kate now carry new titles - Duke & Duchess of Cambridge - in relation to tradition. Here's wishing the royal couple an abundance joy & happiness for their marriage & may their romance continue to blossom in years to come.